Various inkle bands, cotton and wool. The administration of Robert Watson’s estate (Shopkeeper. Selby, Yorkshire). [This inventory listed all sorts other things… (three barrels of herring), oil, a huge inventory of spices, and tobacco]. INKLE Now rare. 1532 [First usage]. A kind of linen tape, or the thread or yarn from which it is made. Over three hundred years on but only a few miles away from the now forgotten site of Mr Watson’s shop, I’ve been busy inkling, too. Something I have done on and off since the 1980s, although I only ever did simple threaded in patterns before and now am finally learning how to do pick-up patterns. 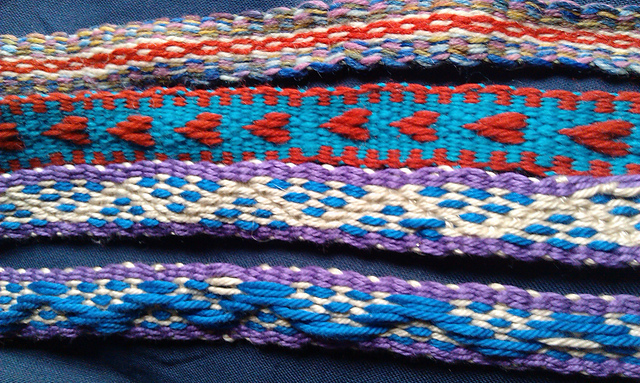 Almost every band I’ve woven recently has been pressed into immediate use – I’d forgotten how handy inkle bands are! I made one into a phone case, nalbinding the edges together; two others became ‘hinges’ for my two wooden clothes horses; another became a strap for a homemade duffel bag, and yet another, the waist tie for one of my 1800 period petticoats. Currently, I’m weaving edgings for a new viking outfit. When that’s done, I have a hatband to make. Then some little straps for my bike bag. Then, maybe a dog collar… It’s wonderful how useful this stuff is! I’d like to weave aimlessly, for the fun of it, but every time I start something I think of an immediate ‘urgent’ use for it! 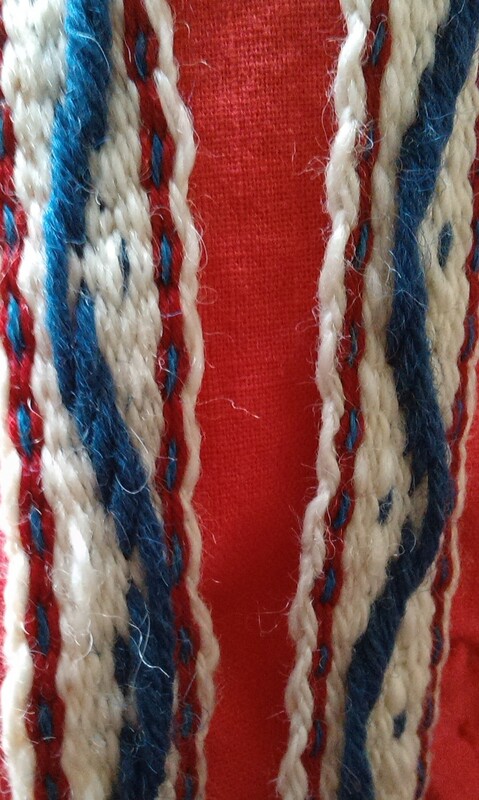 I’ve been weaving bands to go round the neck, sleeves, and skirt of a viking dress I have been hand-sewing. 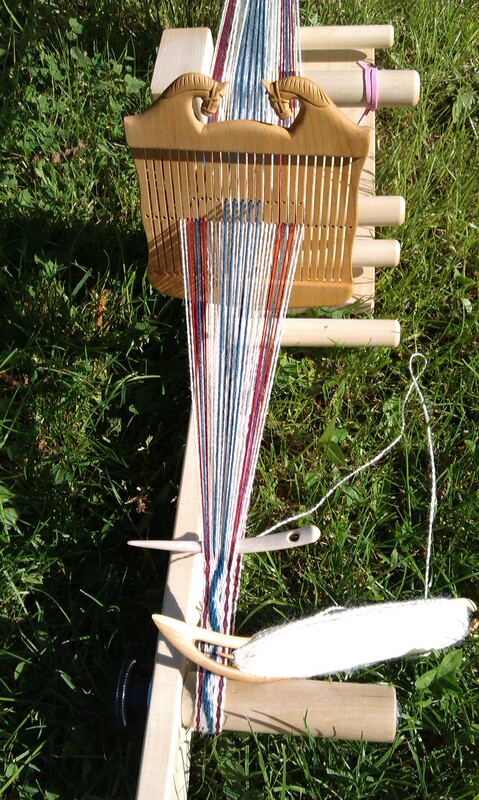 My inkle loom does eight foot (ish) lengths and it has taken two lengths so far and will need part of a third. I will also be weaving for the neckband of a contemporary linen dress (Merchant & Mills’ Trapeze dress) as I have made two of this dress now and didn’t have fun with the facings, so am going to use handwoven inkle bands in place of bias binding on the neckline and armhole edges, to reinforce it without having to use a facing. I will need to weave this from some fairly fine linen or silk. Bands for edging to viking dress. White handspun wool for background; millspun oddments for pattern. So far I have used commercial cotton, commercial worsted wool as well as handspun, and commerical silk and linen thread. Like the nalbinding it is brilliant for using up odds and ends, and am finding some Mystery English Longwool handspun, from a couple of years back, to be a more than adequate warp. It helps that it is a longwool and spun in a worsted-ish way. I learned pick-up (finally) by using one of the brilliant double slotted Sunna heddles from Stoorstalka in Sweden. 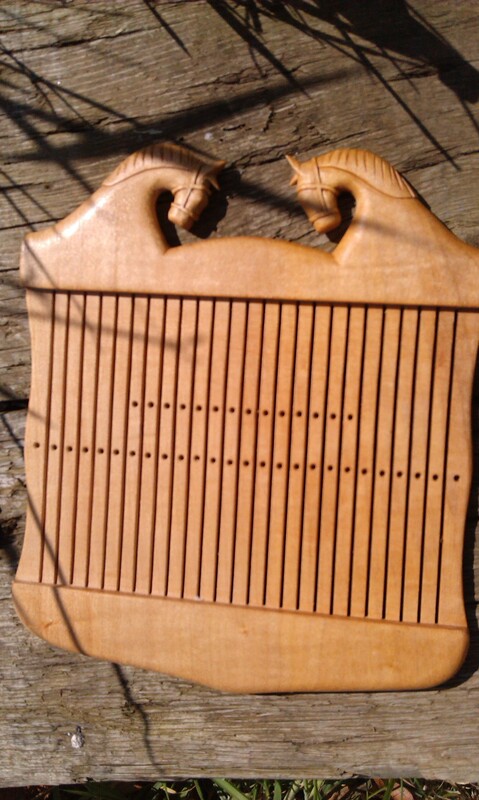 But am also now using a double holed heddle from Vavkompaniet (also Swedish) and am slowly figuring out a couple of different types of pick-up. 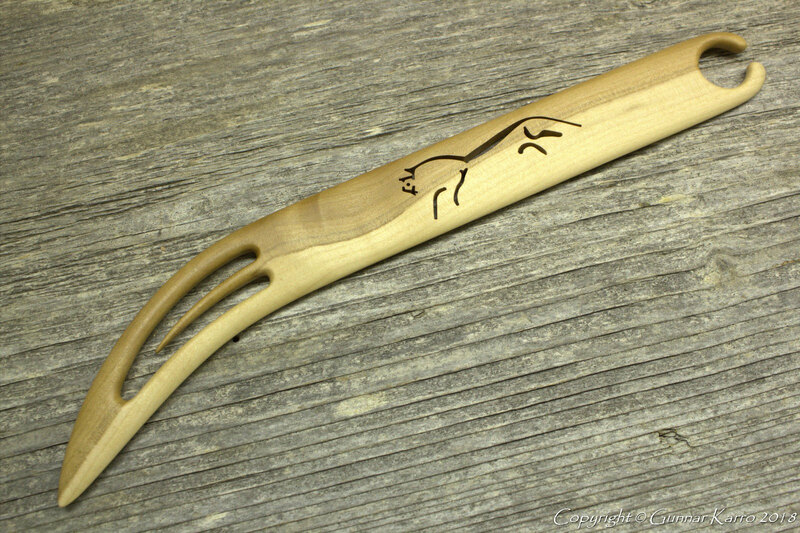 I treated myself to a stunning curved Sámi shuttle, from Ampstrike on Etsy (Gunnar Kallo), which has the Uffington horse on it, to go with my horses heddle. I have a number of shuttles but find the curved Sámi style ones indispensible for pick-up. Although with the double holed heddle I also sometimes use a nalbinding needle to help with the pick up, if it’s a tricky row! It is thought possible that the Anglo Saxons and Vikings may have used backstrap looms which have left no archaeological evidence – the Oseberg ship finds included a complete tablet loom, but some textiles were edged with what we’d now think of as inkle weaving. This could just as well be achieved with a backstrap set-up, and would be structurally identical bands to those woven on a modern inkle. So we will be playing with some viking crafts, including a bit of backstrap weaving, over the summer – message me here or email if you’d like to join us inkling in the viking houses! (Or indeed if you’d like to learn this one to one, or in a small group). We can teach you using a floor inkle, a Schacht, a backstrap set up or you can indeed bring your own loom, if you want to learn the basics! For home use, and not living history, I went with a Schacht inkle loom from The Loch Ness Spindle Company. My old inkle loom was a generic one got in the 1980s from Fibrecrafts (now George Weil) – that no longer seems to be in production. It was never pretty. It vanished when I left it in a school stockroom, when teaching kids to inkle, a few years back. In the UK, the only real choice of inkles is between Ashfords and Schacht and I went with the latter, as I have a pair of Schacht hand-cards I’ve had for over 25 years, still going strong, which I love and also preferred the look of the Schacht. It has had one warp or another on it, virtually since the day I bought it, a couple of months back. If buying an older Ashford, be wary of the paddle system on the tensioner – now phased out but I know many people have had problems with them. Years ago, I wrote a couple of articles on how to do simple inkling, for the lovely, late and lamented UK magazine for spinners, ‘The Spinsters’ Almanack’. If I can find those old articles, will scan them and put them up here as a resource for those who’d like to learn how to inkle. Although I now only really inkle using rigid heddles – to bypass the tedium of making string heddles. But your mileage will vary. Many folk prefer string heddles. If you want to learn pick up techniques, I’d recommend trying a Sunna heddle. They are user-friendly, sturdy, and take some of the brain ache out of weaving your first few Baltic or similar style bands. But you will be limited by the number of pattern slots. Once you have your head round it, you can switch to string heddles, or a plain rigid heddle, or a heddle with a double row of holes which are slightly less user friendly for the beginner, but more versatile. Pick up inkling in progress.